Looking at massive amounts of data can be like peering across a lake on a foggy day— you know there’s something on the other side, but you can’t quite make out what it is, no matter how hard you look. If you take in that same view on a sunny day, you’ll see clear across to the other side. Wouldn’t you like that same clarity when you’re evaluating your company’s data? When you have clear visual representations of your data, it’s easier to make sense of information, no matter how complex. With Microsoft’s Power BI solution, you gain access to a variety of data visualizations that will help you make the most sense of your data. As one of the essential foundations of Power BI, visuals give you a simple, fun, and creative way to showcase your data insights. The visuals can be as simple or complex as your data calls for— ranging from pie charts and maps to matricxes, waterfalls, funnels, gauges, and more. Power BI also includes industry-leading tools that make it easy to format your data in a way that brings your story to life. When it comes to formatting your visualizations, Power BI gives you two options: drag-and-drop or single-click selections. After choosing the visual that best represents your data, you can simply drag-and-drop selections of your data into the visualizations tile, which will automatically add them to your visual. Power BI also gives you the option to customize the data on your visuals by resizing, converting views between multiple visuals, and making cosmetic changes such as background alignment, title text, and data colors. Once your visuals are set, you can hover over them to see the various segments of your data. As mentioned above, Power BI has a plethora of options for turning your data into a compelling visual story. You probably have a general understanding of the basic ones such as pie charts, maps, and bar graphs, so below are the names, features, and functions of some of Power BI’s most unique visualizations. Waterfall Chart—If you are interested in seeing how the value of data changes over the course of time, a waterfall chart might be for you. A waterfall chart is similar to a line graph but shows a range for each piece of data as opposed to a baseline range comparing all data, which allows you to see variations more clearly. This chart is great for tracking data such as the range of sales per year over multiple years. Funnel Chart—To track data that changes at the hands of a particular process, you’ll want to check out funnel charts. Also, similar to line graphs, funnel charts let you see each piece of data from the top down according to size. Funnel charts work well for analyzing sales pipelines orand tracking your newsletter subscription numbers per month. Gauge—Many visuals are made to compare multiple pieces of data, but sometimes all you need is to take a deeper look at one piece of data, which is why Power BI gives you gauge cards. This visual helps you track Key Performance Indicators (KPIs) or a single metric over time. Gauges are great for showing progress towards a specific goal and add a nice touch of clarity when creating a dashboard of your own. Matrix—When you have too many pieces of data from too many sources, visuals become tough to make and they might require the palatability of a table. A matrix is like a table, as it is in the column and row format you’re used to, but a matrix allows you to create different category headers to give your data some dynamism. You can customize your matrix with features such as sizing, toggling rows and columns, and setting colors. Creating a matrix with Power BI brings a whole new dimension to creating tables. Power BI’s visuals look amazing! How do I get them? 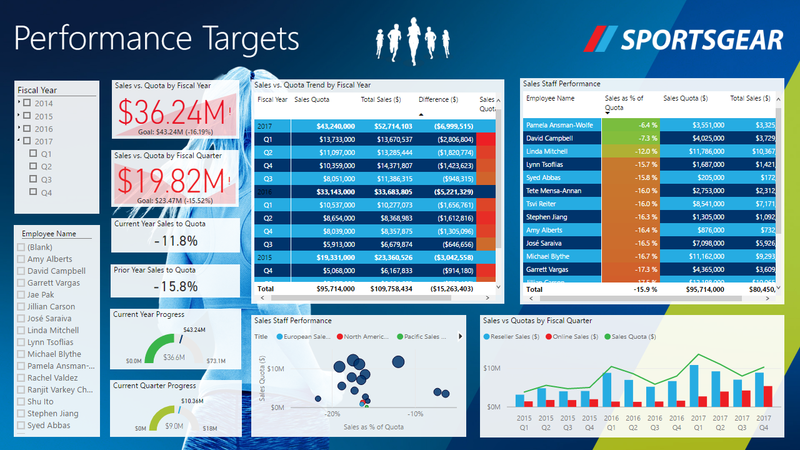 You have seen just a small sample of the remarkable visual presence Power BI can add to your data and reporting— and we have yet to even break the surface. To get a better picture of the full extent of Power BI’s visual data capabilities, contact Inviso today at info@invisocorp.com.